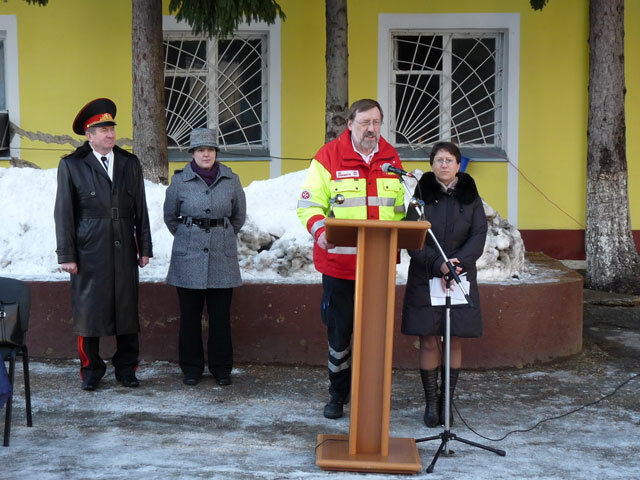 German organisations "Johanniter", "Antena Bayern", Mr. Ulrich Wiessmann and the German Embassy in the Republic of Moldova organized the Christmas action for deprived people of Moldova this year too. 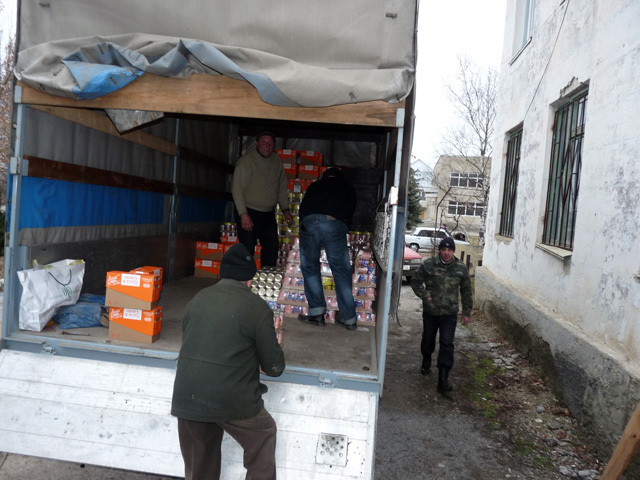 After many difficulties that were successfully overcome, and a long heavy road about 9000 Christmas presents reached Moldova today. 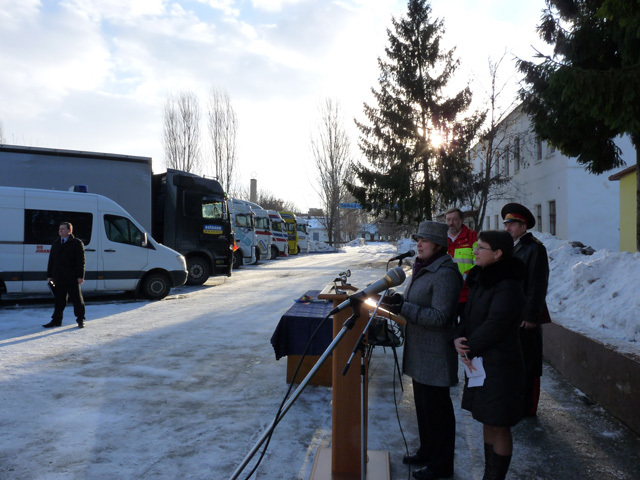 The local organizer of the Christmas action in Moldova was the Secretary of the Interior Victor Catan. 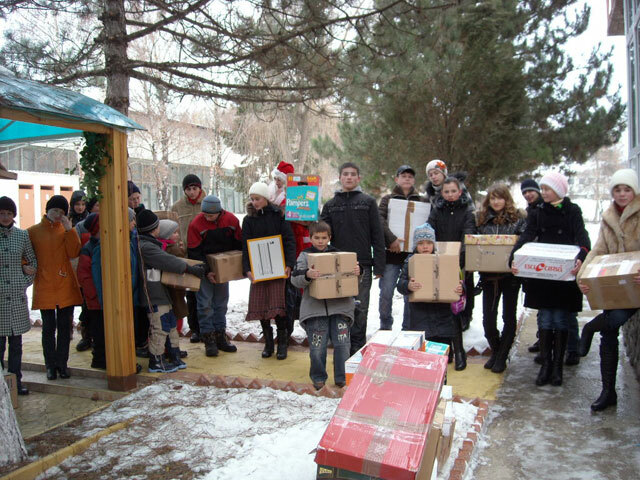 A part of the Christmas packages were distributed to our BUNVOLENTIA projects at once. The contents of the packages were so substantial that children needed sledges to bring them home. The annual meeting with the members of the board of PRO UMANITAS took place on December 16, 2009. The major task of the meeting was reporting the results of our activity during the year 2009 and presentation of perspectives for 2010. Members of the board expressed their plans and ideas, gave advice. An important advice was given to us by our auditor: She familiarized us with new laws regarding the accounting; according to the new legislation the accountancy will be reorganized to European standards. Christmas – joyful, blessed, graceful time! Christmas – hearts warmth, glitter in children's eyes. The wonderful Christmas action has come to an end and left behind over 1500 happy children souls. 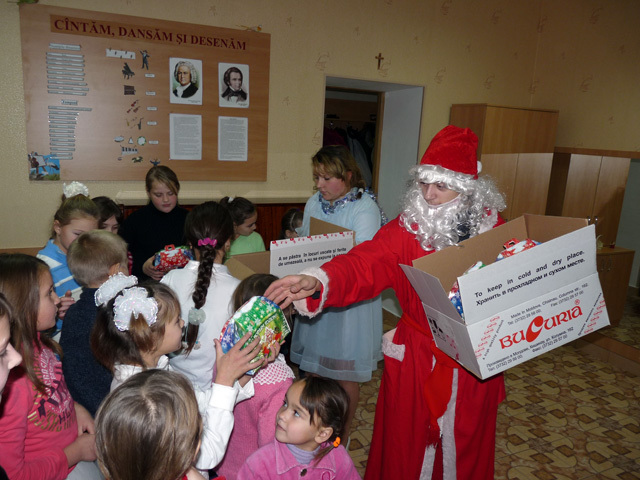 Santa Claus came with his presents and shared sweet Christmas gifts to children from different regions of Moldova. Sincere thanks to priest Hans Bock from Regensburg / Germany who made that possible. The traditional Christmas action has already began. 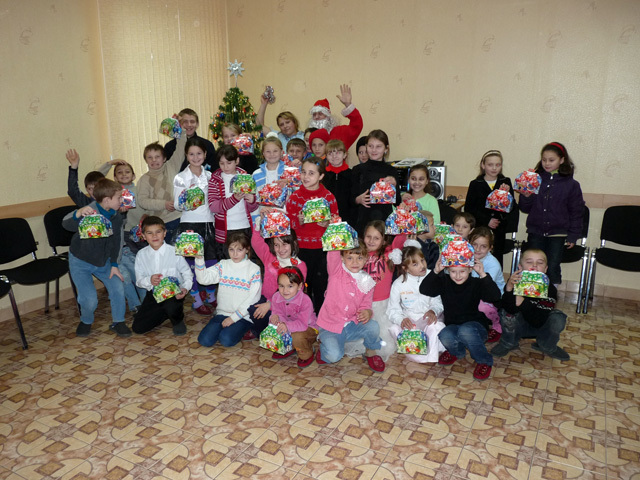 Over 1500 children from Moldova will enjoy Christmas presents on the occasion of this special feast. This wonderful action was possible due to the financial support of priest Hans Bock from Regensburg, Germany. The 5th seminar within the day care centers for children BUNVOLENTIA took place on November 12, 2009. BUNVOLENTIA increased to 13 centers. The seminar began with the blessings and admonition of priest Daniel. The coordinators and teachers exposed the centers' activity as well as the existent problems, development perspectives and initiatives. 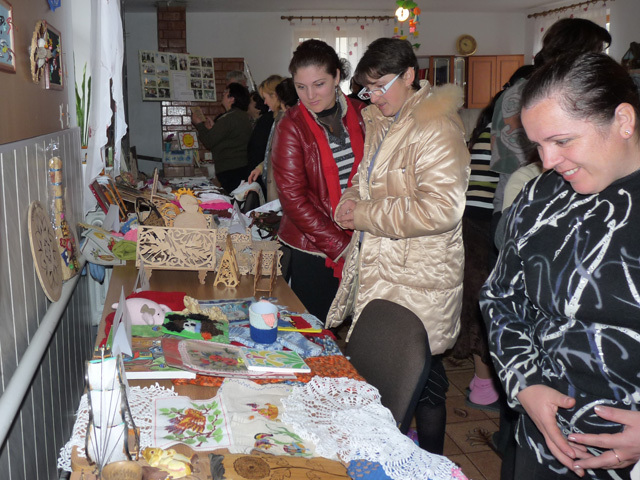 The exhibition of children's handworks reflected the progress and great results of the centers' activity. 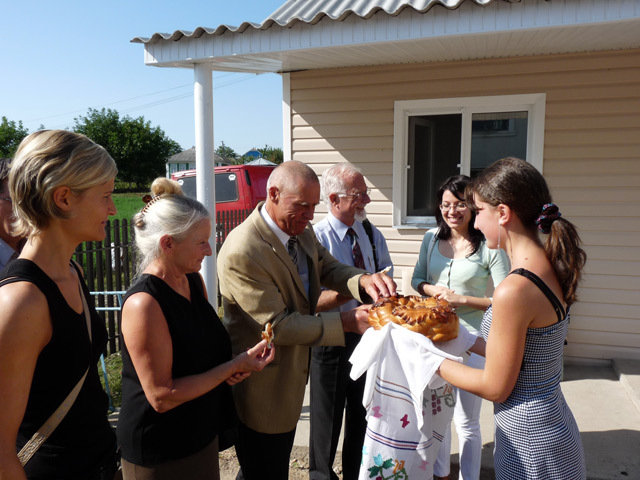 Within their 15th trip to Moldova the president of HCN from Switzerland Mr. Peter Garst and his wife, Mrs. Martha Garst visit the projects that they accomplish in our country. The major tasks of this trip are the 12 day care centers for children BUNVOLENTIA and the opening of a new center in Bilicenii Vechi. 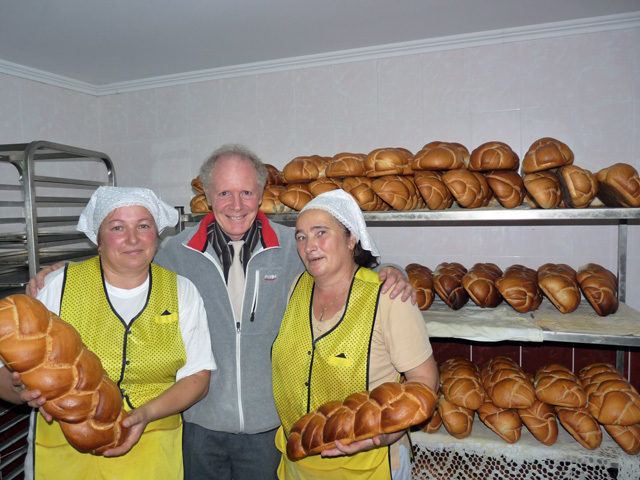 The bakery that was opened in Ochiul Alb village 1 year ago has great success. The appetizing bread of Ochiul Alb is well known and beloved outside the village. The Bilicenii Vechi village, Singerei district receive dear guests from Switzerland, the president of the Swiss organization "Help for Children in Need" Mr. Peter Garst and his wife Mrs. Martha Garst on the occasion of the official opening of the 13th day care center for children BUNVOLENTIA within the local school. It is a special event that brings happiness to children from deprived families. The mayor of Bilicenii Vechi village, the president of the Singerei district and the press took part at the opening of the center. The soup kitchen within the school of Grigorauca works over again from the beginning of the new school year, thanks to the organization "HILFSWERK Liechtenstein". It encloses 84 children that go to our day care center "Saint Maria". The priest of the local Catholic Church and the school director are very engaged in this project. "A good nourishment and education represent the best motivation for the multilateral development of children", said the school director. 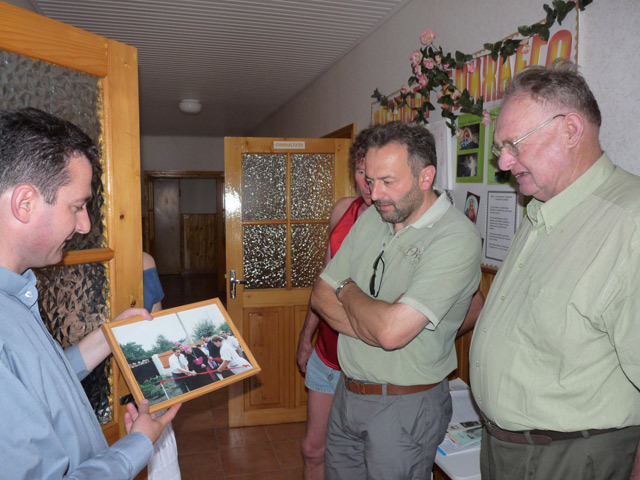 A delegation of Rotary-Club Zug-Kolin visited on their's own initiative and escorted by P. Erwin Benz different works of our charity organisation. This club has already stored cloths and wool for our sewing workshops; it is interested in our projects. The delegation also visited the centre with outpatient department for blind children and children with sight injures as well as other hospitals. An important event took place on September 26, 2009: The already traditional meeting with the students implied in the bursary program financed by Mrs. Douglas Funk from Solon Foundation. 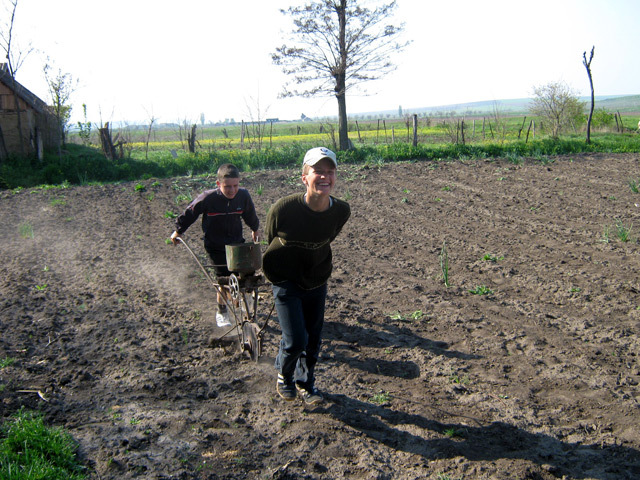 The bursary program supports the university fees of 50 students from deprived families of Moldova. During the meeting they were familiarized with the requirements of the program. At the end of the meeting the students showed their gratitude to Solon Foundation by expressing their thoughts and feelings in a speech. 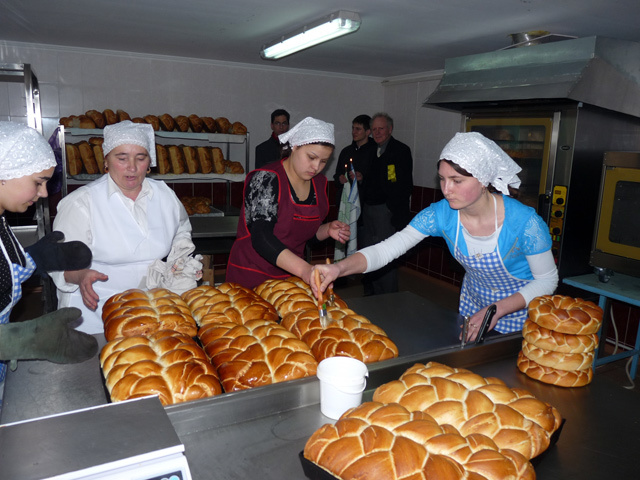 Geiges family from BLIDOR visits the bakery in Ochiul Alb village; they financed this project with Schmitz-Hille-Stiftung. Father Erwin Benz escorts the guests by order of HCN. 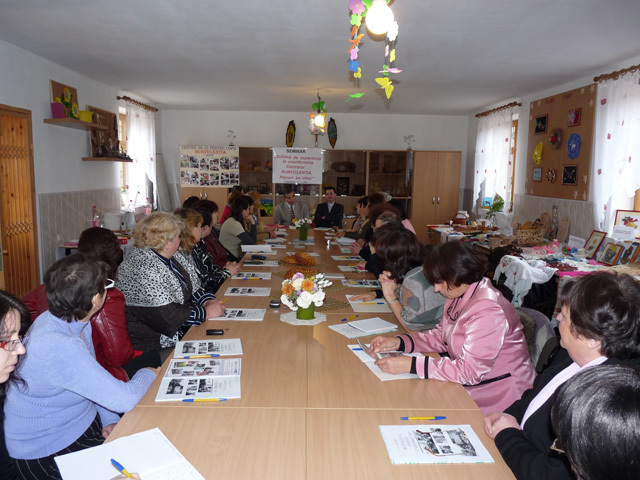 As for the rest, six day care centers for children BUNVOLENTIA were visited. They were received by the ophthalmologist Dr. Tatiana Gidirimschi after that. Dr. Ghidirimschi presented to the visitors the centre with outpatient department for blind children and children with sight injures from the state rehabilitation orthopedics that is in progress. 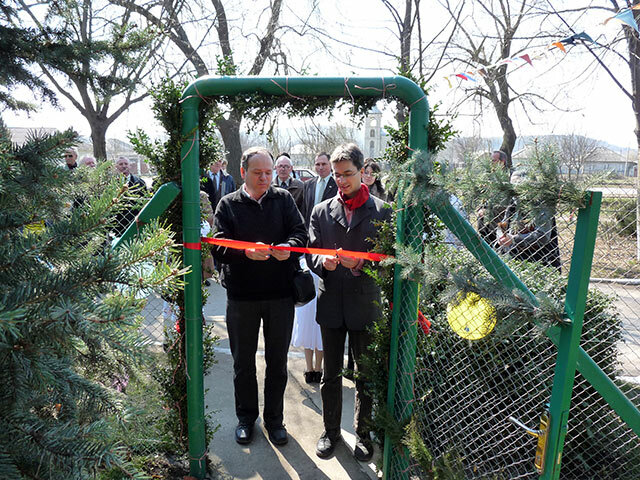 The president of the Singerei District Mr. Vasile Doga took upon himself together with the mayor of Grigorauca village Mr. Anatol Hajevschi the official opening of the second day care center for children and the joinery that is part of the center. Father Erwin Benz represents HCN from Switzerland that made possible the implementation of this project. 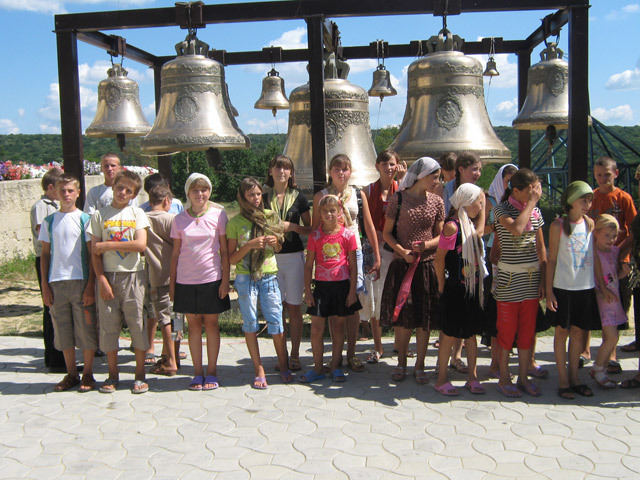 Children from our day care centers for children BUNVOLENTIA had the opportunity to visit the sights of Moldova, to see the most beautiful historical and cultural places of their motherland within already traditional summer camps this year too. Remarkable were the trips to the most famous cloisters of Moldova. Different contests, games and entertainments brought joy and happiness to our children. 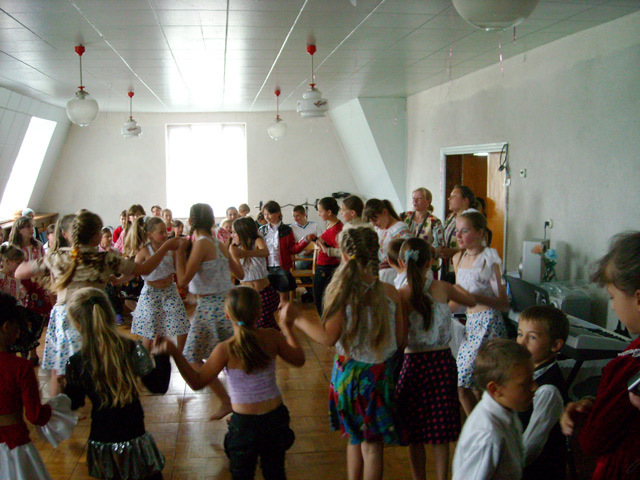 The Children's Home of Familial Type and the Day Care Center for Children "BUNVOLENTIA – Cojusna" changed its status due to different circumstances. 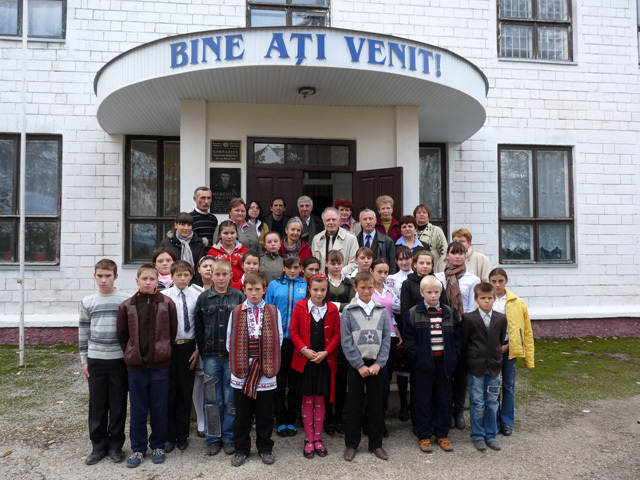 The future Center will consists of 2 groups each of 20 children from deprived families of the Cojusna village. Healthy warm meals after school, doing of the homework, occupation with professional orientated activities are the basis of the Day Care Center. 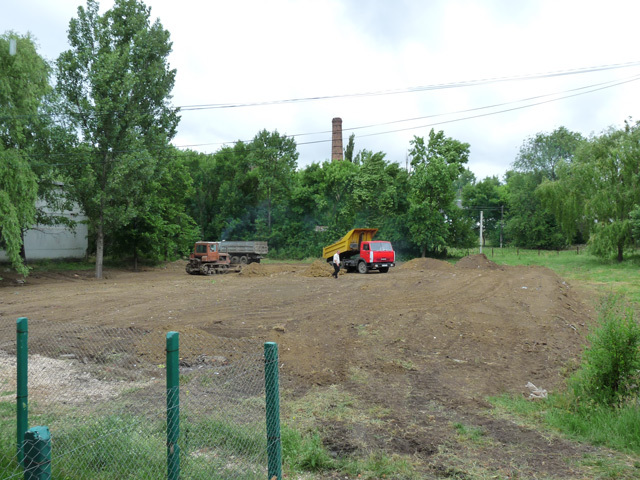 Thanks to the status change, the Center's field of activity could be enlarged. In addition joinery and sewing courses are offered to the children. A special guest from Germany, Mr. Georg Stangl visited our country this week. 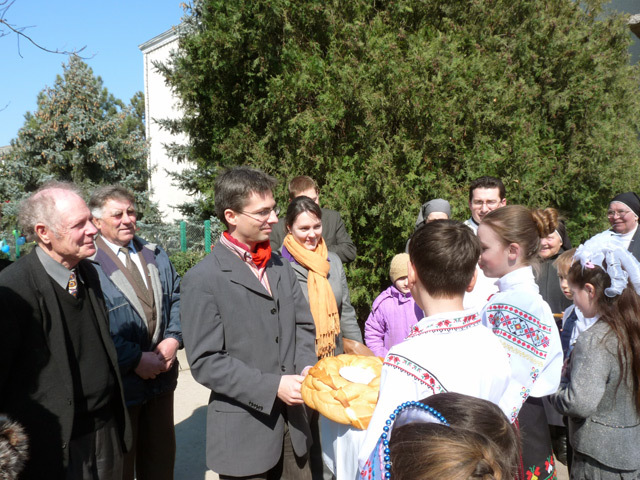 It was his first visit to Moldova. Mr. Stangl familiarized with the activity of PRO UMANITAS and visited various projects of the charity association. Through the mediation of “Help for Children in Need” the ophthalmologist Dr. Tatiana Ghidirimschi and a social worker visited the center SONNENBERG for visually handicapped in Baar (Switzerland). They gathered information and experience in oligophrenopedagogic center for building and administration of a consultative center for blind and visually handicapped with an outpatient clinic in Chisinau. They familiarized with various pedagogic offers in such fields as pre-assistance, consultation and support, practical skills and Low Vision. Both specialists are convinced that this visit will serve to the project. Thanks to the financial support of Moldovan organization „SÜDZUCKER MOLDOVA SA“, of the „Franziskusgemeinschaft“, Austria and Swiss organization „Help for Children in Need“ the first steps to implementation of the project “Sports and play ground for the day care center for children “Saint Maria” from Grigorauca village” were taken in a short period of time. More than 1000 m³ land were delivered for the leveling of the territory. 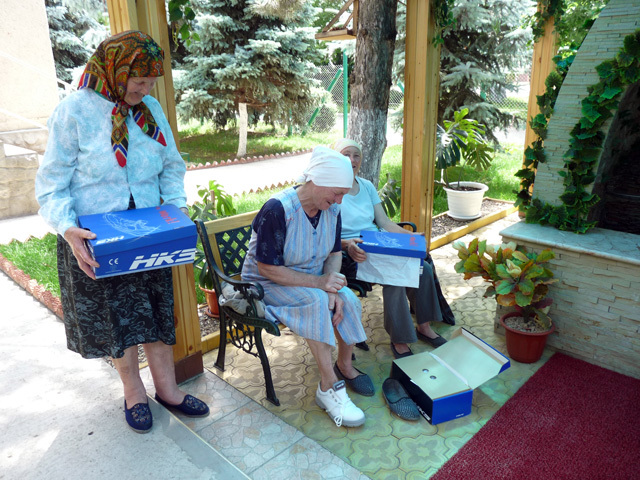 The old and deprived people from Grigorauca village had a new reason for joy and happiness – Thanks to Mr. Josef Schmacks and Mrs. Regina Weiss from Germany they received new clothes and shoes. It is a big support for the old and deprived people that have no possibility to buy such things. Throughout 17 years our German partner organization „Hilfe für Osteuropa e.V.“ supplied our country with necessary medical equipment, medical supplies for nursing care, hygienic means, food products. During the last visit of Mr. Thomas Honeck, the vice-president of the above mentioned organization, His Eminence, Metropolitan of the Orthodox Church of Republic of Moldova Vladimir decorated Mr. Honeck with an order as acknowledgement for the offered help to deprived people of Moldova. Children from our BUNVOLENTIA projects continue to amaze us with their kindness, compassion and friendliness. On occasion of Child’s Day their prepared little surprises one another. So, children from our projects congratulated one another on this beautiful day, dedicated to them. Hearty welcome, small presents made by the children themselves, sweets, different competitions, discussions, games and entertainment brought them great pleasure and happiness. This exchange of experience, thoughts and impressions was necessary, important and interesting, because such meetings broaden the children’s outlook. 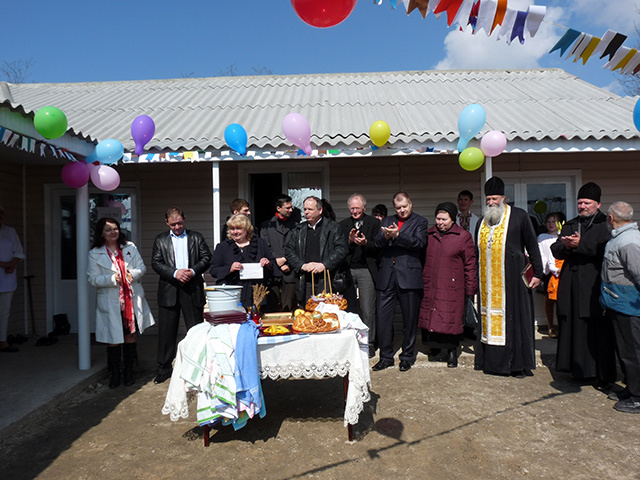 A new day care center for children BUNVOLENTIA will bring joy and happiness to another 20 children from poor families. 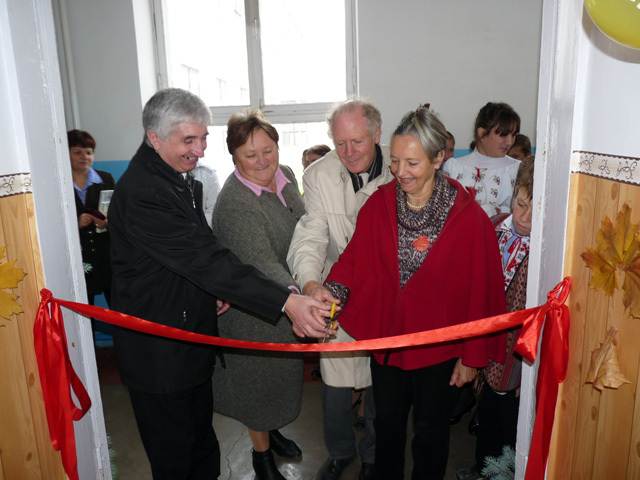 The second day care center for children was opened in Cozesti village on May 15. 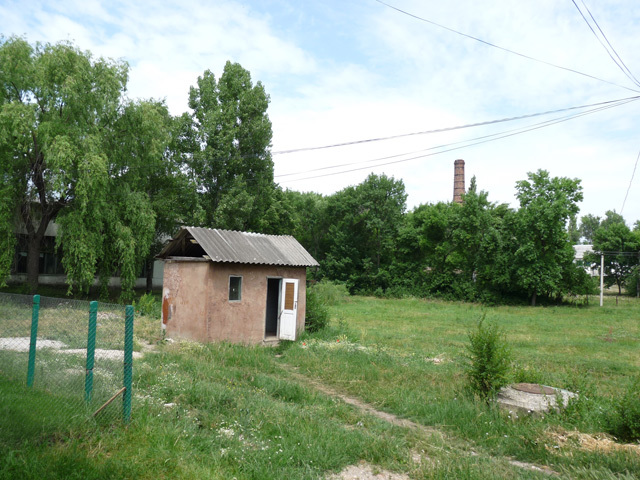 The necessity of opening of the second day care center in this village was determined by the large number of poor people in an isolated area. 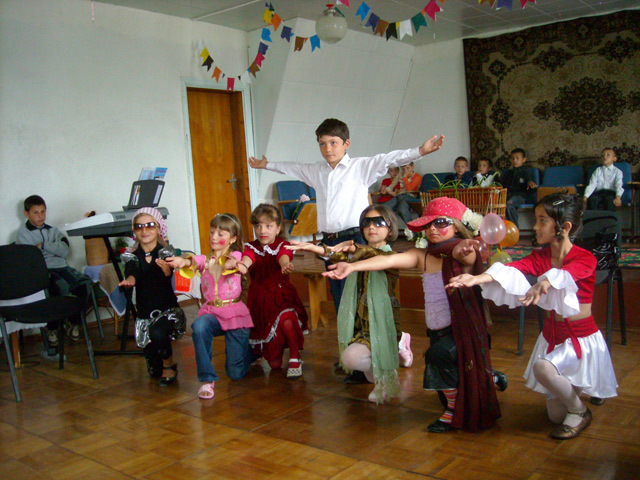 There are 12 day care centers for children functioning in different regions of Moldova at present. 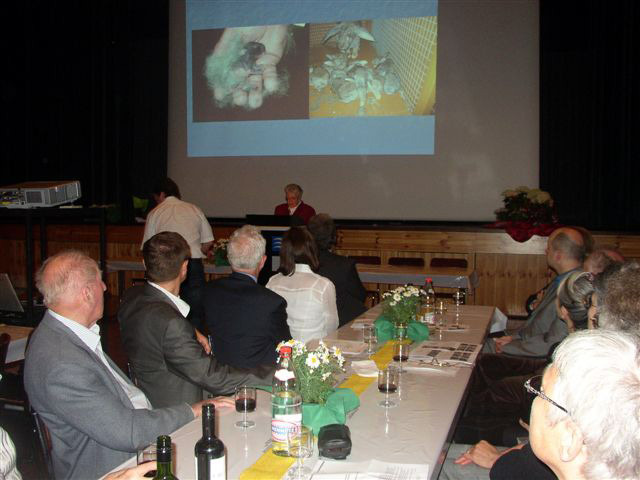 The small Principality of Liechtenstein is a “Pearl of readiness to help within its territory and outside it” – as Hilfswerk, which held an annual meeting in Triesen on May 8. Guests of the meeting were among others Princess Marie, wife of Prince Hans-Adam II. as well as Mr. Peter Garst and his wife Martha from HCN. 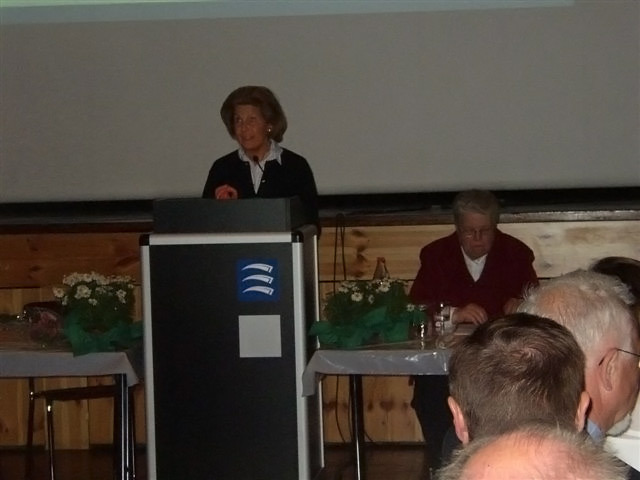 The President, Mrs. Beatrice Amann, who is already engaged through PRO UMANITAS in Straseni and day care centers for children, presented the projects of Hilfswerk in the whole world. It is overwhelming what such a small country with many volunteers does in the big distant world. 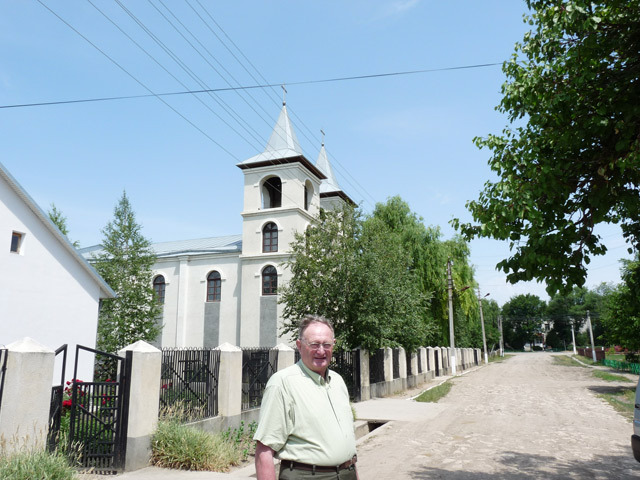 Father Erwin Benz presented the projects of “Help for Children in Need” and PRO UMANITAS in an also small and often forgotten country, Moldova. We will certainly hear forward from Liechtenstein again! 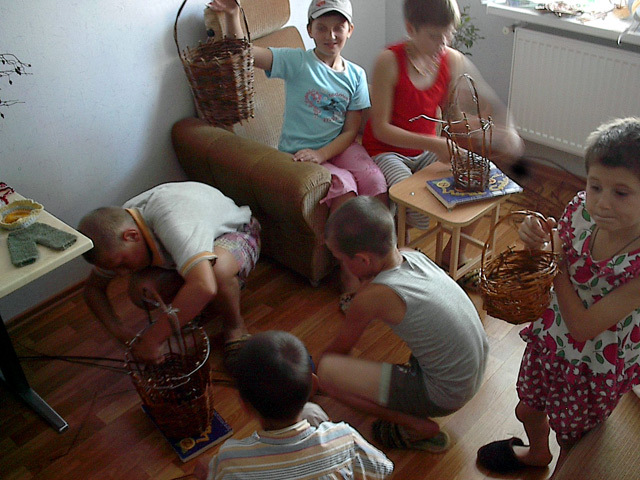 Children from the Day Care Center BUNVOLENTIA – Cozesti are talented and eager to learn the joinering. An efficient teacher shares with them the necessary knowledge for the theoretical and practical studies. But the studies are complicated by lack of appropriate rooms. The principal offered us rooms for joiner studies, which need repair. 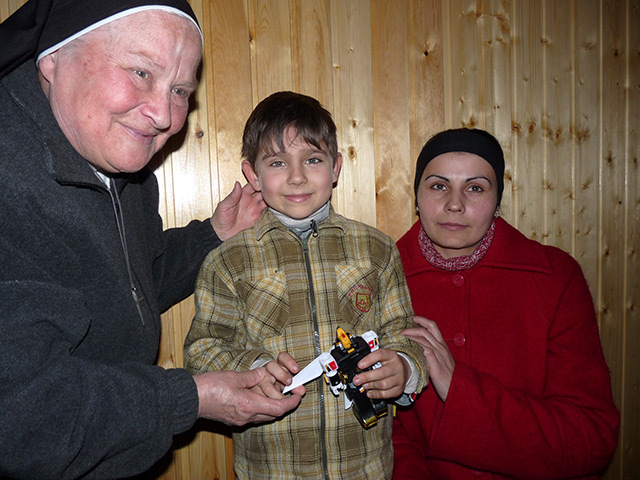 Thanks to financial support of priest Bitzi from Switzerland was possible to begin the repair works of the offered rooms and to provide the children with appropriate rooms for good studies, thus our activity in Cozesti essential enlarges. 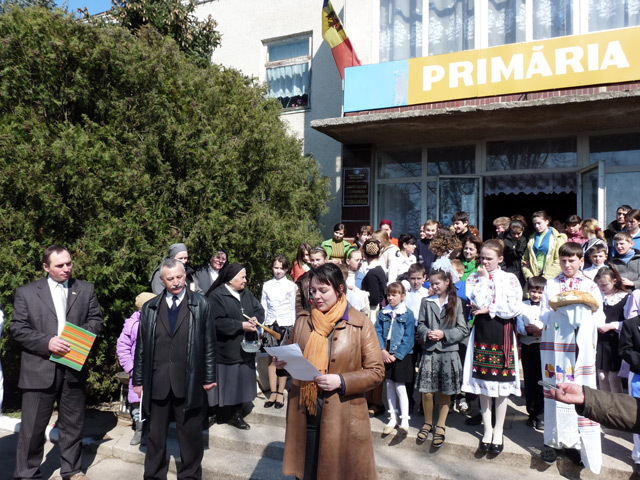 The roof of the school building from boarding school for children with slight mental handicap in Calarasi was partially repaired. Thanks to a productive cooperation with German organization „Schmitz-Hille-Stiftung“, with Partner town Bühl and District Council Calarasi and thanks to mutual efforts the remainder part of the roof (total surface 980 m²) was renovated. The president of the District Council Calarasi Mr. Ilie Rau (the second from the right) was present at the project presentation. Mrs. Julia Krummenauer, Permanent Representative of the German Embassy in Chisinau came to the official opening of the Day Care Center for children „Saint Maria“ in Grigorauca village and brought good news: The German Embassy gave its consent for the financial support of our project “Furniture for Day Care Centers for children BUNVOLENTIA – Petropavlovca und Copaceni”. 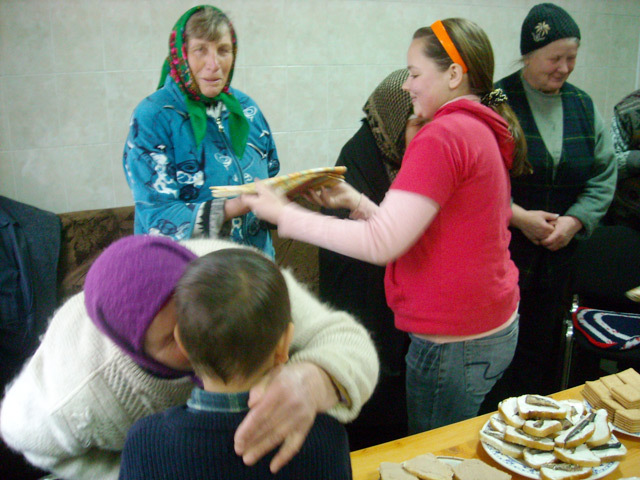 A special event for the whole Ochiul Allb village took place on March 27, 2009 – the official opening and blessing of the new established bakery. Guests of honor from Switzerland and Germany, Mr. Peter Garst, President of the organization „Help for Children in Need“ /Switzerland/, Mr. Ralf Kresal, Executive Director of the organization „Schmitz-Hille-Stiftung“ /Germany/, Dr. Robert Roithmeier, President of the organization „Menschen helfen e.V.“ /Germany/, Mr. Robert Zormeier, member of the same organization, representatives of regional and local authorities, as well as the villagers from Ochiul Alb took part at the event. 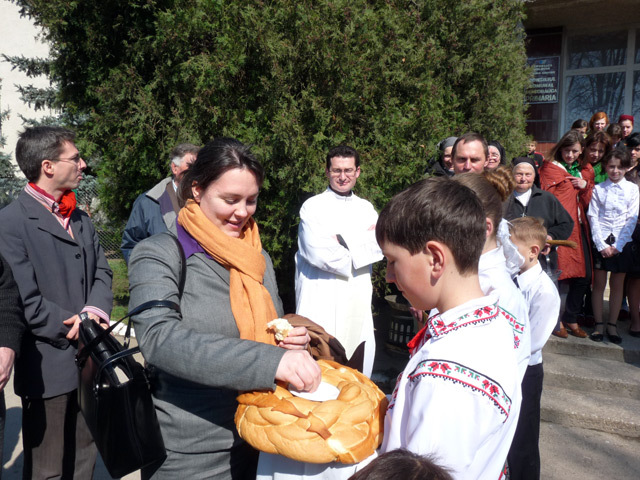 The priest of the local Orthodox Church blessed the bakery. 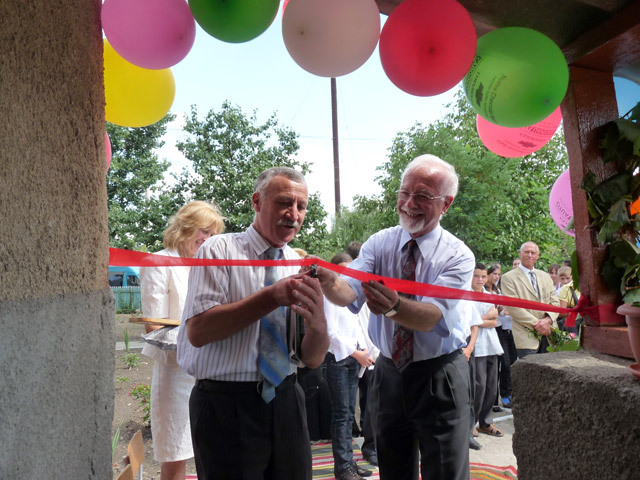 On occasion of the official opening and blessing Day Care Center for children „Saint Maria“ from Grigorauca village gave a cordial welcome to our special guests: Mr. Ralf Kresal, Executive Director of the organization „Schmitz-Hille-Stiftung“ /Germany/, Mr. Robert Roithmeier, President of the organization „Menschen helfen e.V.“ /Germany/, Mr. Robert Zormeier, member of the same organization, Mr. Peter Garst, President of the organization „Help for Children in Need“ /Switzerland/, Mrs. Julia Krummenauer, Permanent Representative of the German Embassy in Chisinau, representatives of regional an local authorities. After Mr. Kresal and Mr. Roithmeier cut the red ribbon, the priest of the local Catholic Church blessed the center. All children that visit our center took part at the opening. Guests and locals enjoyed songs and recitations. The little Vladic comes from Grigorauca village. The boy lives with hi mother at his grandparents that are old sick people. He suffered an eye trauma during a game. Vladic almost lost his sight and cataract developed. An eye operation was urgent. Since the financial situation of the family was very poor, they could not support this operation. Thanks to the Swiss organization “Help for Children in Need” the eye operation was successfully performed in Chisinau. The boy can see again. 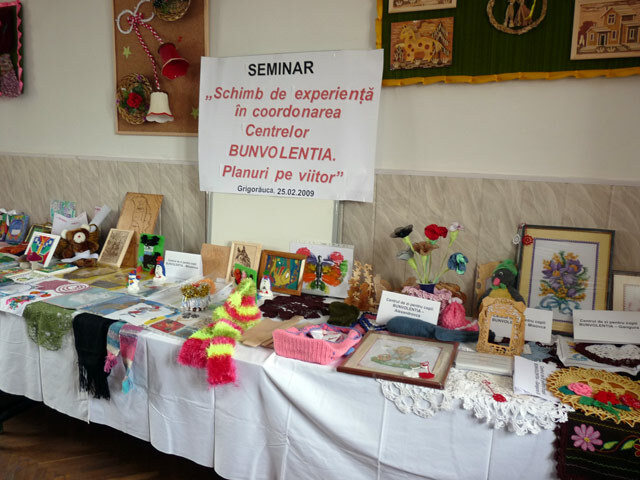 The seminars among the coordinators of BUNVOLENTIA Day Care Centers within PRO UMANITAS became already a beautiful custom. 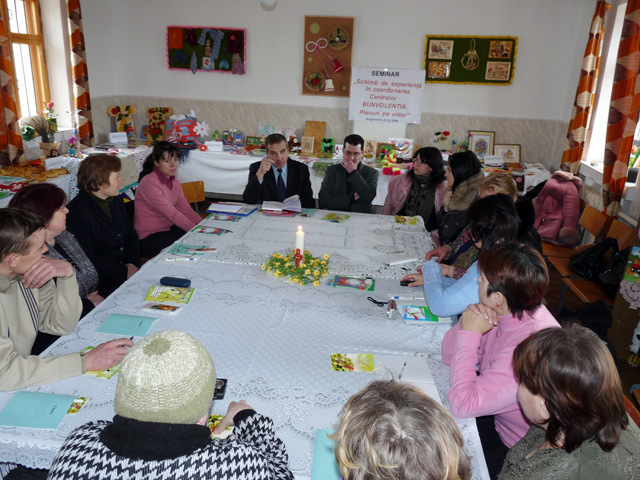 The coordinators of the 11 Day Care Centers for children met in Grigorauca village on February 25, 2009. 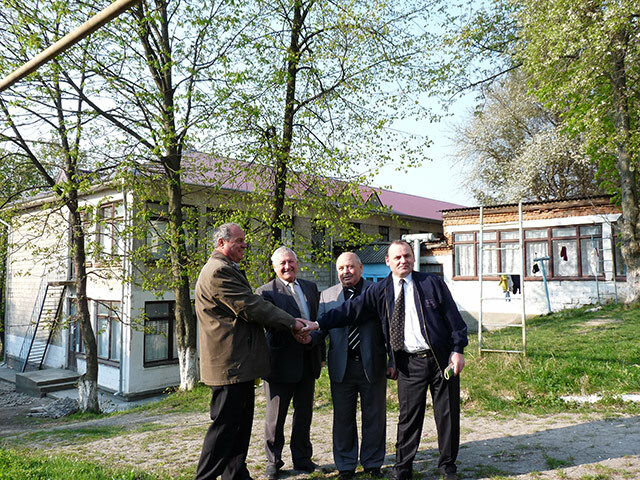 The meeting took place in the Day Care Centre BUNVOLENTIA – Petropavlovca. The coordinators shared the results of the centers’ activity and the future plans for their further development. An exposition with the best children’s handworks was organized. The seminar was a productive exchange of experience for all participants who will use the corresponding information to develop their Day Care Centers. The priest of the local Roman Catholic church, priest Daniel Medves took part at the meeting. 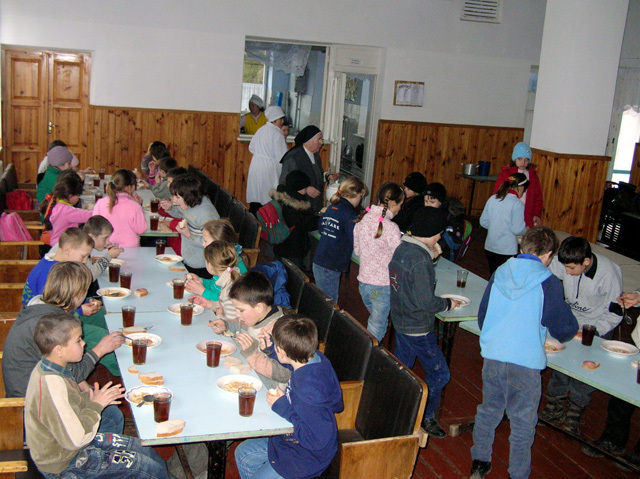 A soup kitchen within the village school from Grigorauca was opened due to the organization HILFSWERK LIECHTENSTEIN on January 2008. 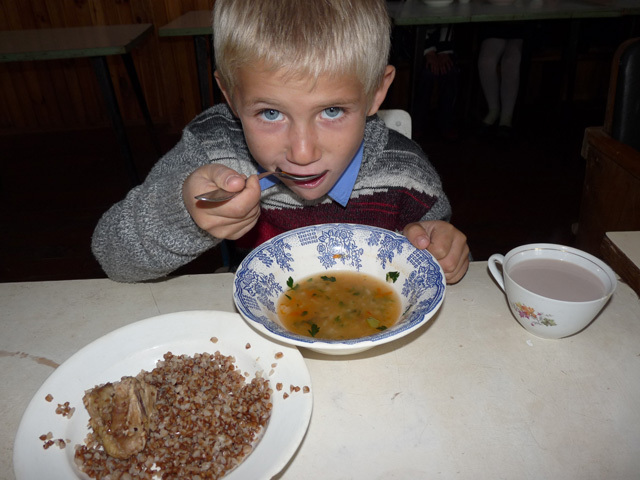 The more children do not receive a healthy meal at home – sometimes they do not receive it at all – the stronger is the necessity to open the soup kitchen. Our soup kitchen feeds 121 children that are implied in our projects Day Care Center BUNVOLENTIA – Petropavlovca and Day Centre “Saint Maria”. A great help to the nourishing process of children render the nuns from the Roman Catholic Church of the village. 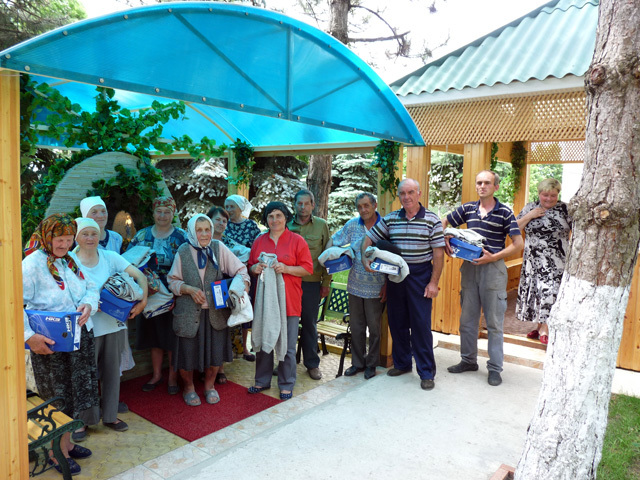 Hope and happiness has brought the Liechtenstein organization HILFSWERK LIECHTENSTEIN to the Moldovan children. Over 3 tonnes of food products were brought into Moldova in order to provide about 290 children implied in our projects with food. The results of the daily activity of our boys from the Day Care Centre for Children BUNVOLENTIA Gangura II are always greater – they made school desks for their centre. The boys plan to make desks for their school and for the girls from the day Care Centre for Children BUNVOLENTIA Gangura I. The constantly developing and sharpening skills of our children, their interest and great effort that they make, are challenges for our future work. The work material is provided to our boys thanks to a special project supported by “Help for Children in Need”, President Mr. Peter Garst.